Home › Pix of the Trade › WestJet Winner! Expedia CruiseShipCenters, Paradise in Vancouver has won the “Windows for WestJet” grand prize. 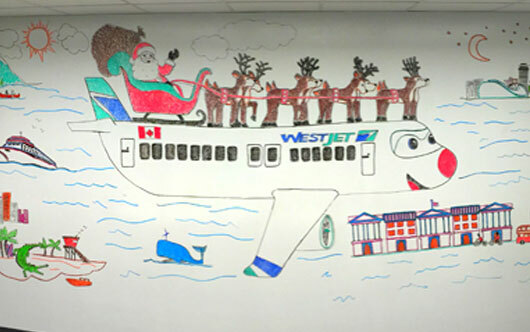 Their submission (pictured) for the WestJet contest earned them the most votes and the grand prize of one round-trip flight for two to any WestJet destination, nine round-trip flights for two to any WestJet destination in Canada or the US and a celebration for the agency. Cassandra Poole from Goliger’s Travel Plus in Cambridge, BC, was awarded the “Voter’s Prize,” awarding her a round-trip flight for two to any WestJet destination.